Home / Giveaways / Zutano Clothes Unique as Your Baby! 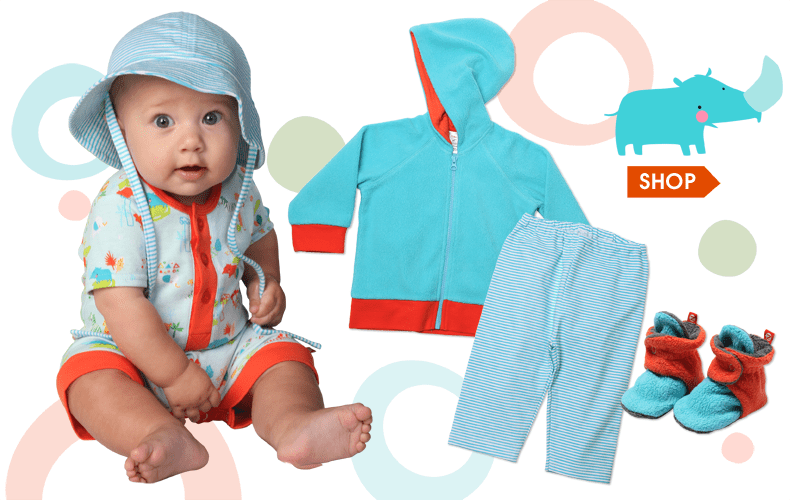 Zutano Clothes Unique as Your Baby! When you have a baby, you have all of the cute wonderful clothes and you just cannot stop buying them no matter what because they are just to adorable. I remember that feeling and trust me when I became a grandma I was even worse. I found a great website for kids clothes about 3 years ago called Zutano.com. They have some of the cutest clothes I have seen for babies and toddlers, but the best thing about these clothes is the durability. About 2 years ago I ordered a dress for Destini from there and now at 4 years old she still wears that dress, mind you she wears it with leggings but, it is in good shape and still washes really well. Not too many clothing items can stand that test of time. These clothes are really some of the best we get. I know that when you check out Zutano.com you will find something that you just fall in love with and you can buy with confidence as the clothes wear so well. They sent me a great outfit for David that has a pair of matchstick pants, a top and a really neat jacket. These pants are made with French Terry that is super soft and comfortable and they have real pockets in the front and back, the color is called pool and they are so vibrant and fun, they have a skinny fit and look really fashionable on even over a diaper! They are 100% cotton so they are easy care! 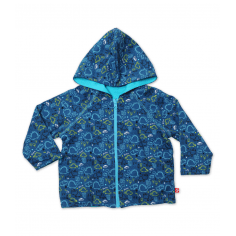 They sent a great reversible hoodie in a dino print that is ultra cute and it is dark blue print on one side and the other it is the same vibrant pool color. I love this hoodie, it is soft and warm and so perfect for our Southern California weather. To make this wonderful outfit complete, the long sleeve shirt they sent is perfect. 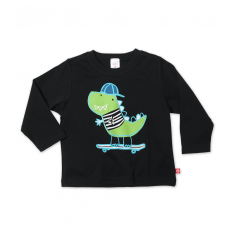 Solid black all cotton shirt with a really cute Dino Skateboarding silk screened on it. When you put it all together, it is just a perfect look for a fashion forward kid, and his parents who love clothes that look good and wear well! When you are looking for that perfect gift this holiday season and you want to send or give something that is not the same old thing, and of incredible quality Zutano.com is the place to shop. Look for our giveaway coming soon with our Holiday Gift Guide!